A secondment to a charity or voluntary work organisation will require two documents, both of which are provided as part of this product. You will receive both an amendment to the secondee’s employment contract to allow him or her to be seconded, and a contract between the original employer and the voluntary organisation (the “host”) setting out the terms of the secondment. During a secondment to a not-for-profit organisation, the secondee works exclusively for the other organisation, usually for a fixed period. The benefits for the secondee usually include foreign travel and working under more challenging (and thus riskier) circumstances than in his or her normal occupation. The largest issue with secondment for the original employer is that he or she continues to carry all the legal obligations relating to the employment, including for the health and safety of the secondee, despite not being in control of many of the circumstances in which the secondee will find himself. Thus, the employer faces the risk of an application to an employment tribunal resulting from an act or omission by the host, or some accident while the secondee is at work for the host. This agreement is designed as far as possible to protect the original employer against failure by the host to comply with both the contract of employment and the general law. It also guards the intellectual property rights of both organisations. It is essential that the original employer and the host agree the terms of the secondment in as much detail as possible. Our secondment agreement has been drawn to include all the common arrangements you will need.You can easily add, edit or remove provisions to suit your arrangement. Our secondment agreement can be used by businesses of any size or in any industry seconding their employees to any not-for-profit. Since the original employer faces most risk from a secondment, we suggest that it is he or she that suggests the terms in the first instance. It is possible to draw a single agreement between all three parties. However, because one agreement may contain terms confidential to only two of the parties we have structured the agreement as two documents. By listing the terms of the secondment in a separate schedule, you have total flexibility on what work the secondee will do, while ensuring all three parties know what is expected. Confirms the secondment of the secondee to the host. The paragraphs confirm what or who exactly is the host and what is the nature of its business. The secondee accepts that the original employer is not responsible if the nature of the work is not as the secondee expects. Additionally, this section deals with access to facilities (including medical care) that might change as a result of the secondment, travel costs and visas. 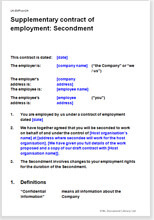 Sets out the term of the contract and the conditions under which it can be terminated. These paragraphs cover how the secondee will be reimbursed for expenses during the secondment, and how his or her benefits and entitlements under the original employment agreement change as a result of the secondment. This section ensures that the host abides by rights that the secondee has under the original employment agreement (so far as they cannot be changed by the secondment) and takes responsibility for the expenses of employment (excluding salary). The original employer should consider whether there is a chance the secondee might leave employment to work for the host full time, and possibly take staff, customers and knowledge with him or her. The section covers the very difficult area of non-compete during and after the secondment. Despite being not-for-profit, all organisations need income, and there is a possibility that the secondment leads to the business of the original employer being reduced. While the original employer remains liable for the wellbeing of the secondee throughout the secondment, this indemnity protects the original employer from the cost of failures by the host to comply with the law. It is especially important if the secondee is working in places where local law may not be known. This section grants the original employer ownership and benefit of any intellectual property that the secondee creates. Of course you can change this to give the benefit to the host.